אלהים (help·info)‎). Despite the -im ending common to many plural nouns in Hebrew, the word Elohim when referring to God is grammatically singular, and takes a singular verb in the Hebrew Bible. The word is identical to the usual plural of el meaning gods or magistrates, and is cognate to the 'lhm found in Ugaritic, where it is used for the pantheon of Canaanite gods, the children of El and conventionally vocalized as "Elohim" although the original Ugaritic vowels are unknown. When the Hebrew Bible uses elohim not in reference to God, it is plural (for example, Exodus 20:2). There are a few other such uses in Hebrew, for example Behemoth. In Modern Hebrew, the singular word ba'alim ("owner") looks plural, but likewise takes a singular verb. 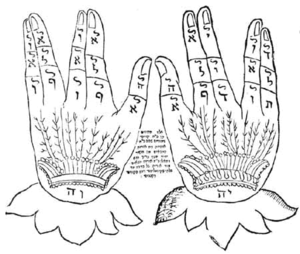 אל שדי (help·info)‎, pronounced [ʃaˈda.i]) is one of the names of God in Judaism, with its etymology coming from the influence of the Ugaritic religion on modern Judaism. El Shaddai is conventionally translated as "God Almighty". While the translation of El as "god" in Ugarit/Canaanite language is straightforward, the literal meaning of Shaddai is the subject of debate. listen), lit. "Armies") appears in reference to armies or armed hosts of men in Exodus and Isaiah but is not used as a divine epithet in the Torah, Joshua, or Judges. In the First Book of Samuel, David uses the name YHWH Tzavaot and immediately glosses it as "the God of the armies of Israel". The same name appears in the prophets along with YHWH Elohe Tzevaot, Elohey Tzevaot, and Adonai YHWH Tzevaot. These are usually translated in the King James Version as the "Lord of Hosts" or "Lord God of Hosts". In its later uses, however, it often denotes God in His role as leader of the heavenly hosts. listen); יהּ, Yahu) appears in the Psalms and Isaiah. It is a common element in Hebrew theophoric names such as Elijah and also appears in the forms yahu ("Jeremiah"), yeho ("Joshua"), and yo ("John", ultimately from the biblical "Yohanan"). It also appears 24 times in the Psalms as a part of Hallelujah ("Praise Jah"). shalom (help·info) in unholy places such as a bathroom, because of holiness of the name. שכינה (help·info)) is the presence or manifestation of God which has descended to "dwell" among humanity. The term never appears in the Hebrew Bible; later rabbis used the word when speaking of God dwelling either in the Tabernacle or amongst the people of Israel. The root of the word means "dwelling". Of the principal names of God, it is the only one that is of the feminine gender in Hebrew grammar. Some believe that this was the name of a female counterpart of God, but this is unlikely as the name is always mentioned in conjunction with an article (e.g. : "the Shekhina descended and dwelt among them" or "He removed Himself and His Shekhina from their midst"). This kind of usage does not occur in Semitic languages in conjunction with proper names. ^ A name for God that simply means "the Name."